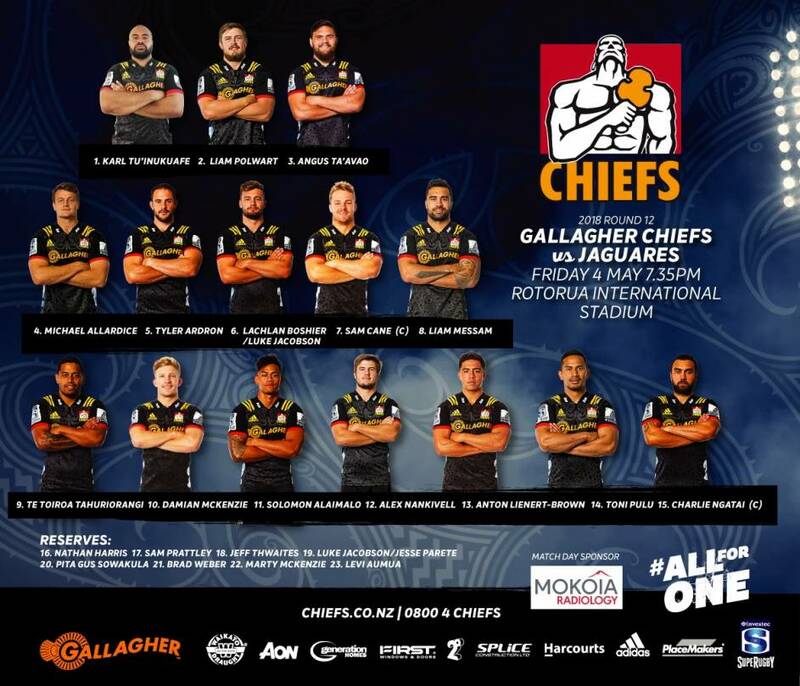 The Gallagher Chiefs fresh off the bye after a strong win against the Reds in Brisbane are ready to face the in-form Jaguares in Rotorua this Friday. It is the Jaguares’ first ever visit to Chiefs Country, after playing the Gallagher Chiefs only once in Argentina in 2016. That game went down to the wire, a late Brad Weber try securing the win. Head Coach Colin Cooper has had some additional time in the bye week to look at the Jaguares. Cooper has kept the same front row which performed really well against the Reds. In the second row, Cooper has decided to rest Brodie Retallick, bringing in Michael Allardice who put in a strong performance against the Hurricanes. The most capped Chief, Liam Messam, will start in the number 8 jersey. He’s from Rotorua and so spoke about how special it will be to play in front of his home support, “I am really looking forward to bringing the boys to my home town. It is always special coming back to Rotorua and we love the local support we get there”. In the backline, Toni Pulu comes back from injury on to the wing, and Alex Nankivell comes in at second five. Johnny Faauli has earned a rest after starting every game so far this season. On the bench there is a potential debut for Levi Aumua back from injury, and for Bay of Plenty loose forward Jesse Parete in as injury cover. Cooper hopes to see some big support down in Rotorua. “We’re really looking forward to a supportive home crowd in Rotorua to help us as we will need to be at our best against the Jaguares”. The game will be played at Rotorua International Stadium and kicks off at 7.35pm. Gates open at 4.50pm for the University of Waikato Chiefs Cup Match between Rotorua Boys High School and Tauranga Boys High School which kicks off at 5.10pm. Mitch Graham; Nepo Laulala; Regan Verney; Tiaan Falcon; Kane Hames; Mitch Karpik.